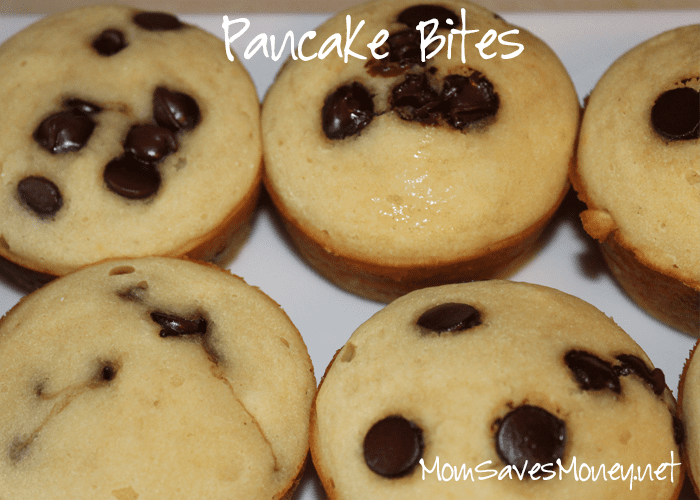 Recipe – Easy Pancake Bites! Some people do a formal menu plan for breakfast, lunch, dinner and snacks. Not me. I’ve always just done dinner. During the week, my babysitter usually takes care of lunch. On the weekends, we usually have leftovers. Breakfast around here has usually been cereal. But then I had my third baby and I found myself a) without a babysitter handling lunches during the week and b) more time and desire to do more than just cereal. So I started preparing breakfasts that weren’t just cereal. In the next few weeks, I’ll share some of my favorites. Today, it’s Pancake Bites. It’s a very straightforward recipe: make some pancake batter, put them in cupcake tins, add some “toppings” and bake. I let them cool completely and put into a freezer bag. Then I just reheat them when we’re ready to eat them. Easy enough! I love that it takes the pressure off and that it makes breakfast ready in just seconds. Grease muffin tins (either mini size or regular size). Fill each muffin tin about ½ full. Add another spoon full or so of pancake batter to get it to be about ¾ full. Bake for about 10-15 minutes. It took me about 11 minutes for mini-muffin tins and 14 minutes for the regular size. Serve them with a little side of syrup. If they’re frozen, just microwave them for 10 seconds or so until warm. I did a double batch of pancake mix (using Bisquick’s recipe on the side of the box) and it made quite a bit. I got 8 regular size ones and 24 mini bites. Jayme is a wife to 1 and a mother to three little boys. She coupons, but isn’t super extreme about it. She price matches and loves it! While she likes to cook, she’s in the stage of life where simple is usually better! She never knows how many hands she’ll have free at dinner time! You can find her at No Regrets Living.